The Turkish Medicines and Medical Devices Agency (TMMDA) has, with WHO support, initiated self-benchmarking of their regulatory efficiency using the WHO Global Benchmarking Tool. Turkey is the second-largest pharmaceutical market in central and eastern Europe, making it a vital global player in the pharmaceutical sector. TMMDA has already taken some steps at the international level, and became a member of the Pharmaceutical Inspection Co-operation Scheme in September 2017. 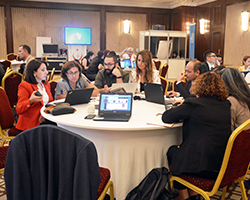 The workshop for initiating the benchmarking process was held in Turkey’s capital, Ankara, on 11–13 September 2018. “We are glad that this workshop has allowed us and WHO to gather in order to prepare a roadmap to take concrete steps in initiating and completing the benchmarking process for TMMDA,” said Dr Hakkı Gürsoz, President of TMMDA. After extensive group discussions, WHO and Turkish authorities set up a roadmap for WHO’s benchmarking of medicines and vaccines produced in Turkey. WHO facilitated and provided technical assistance to its Turkish partners in performing the self-benchmarking process as part of prequalification by WHO.